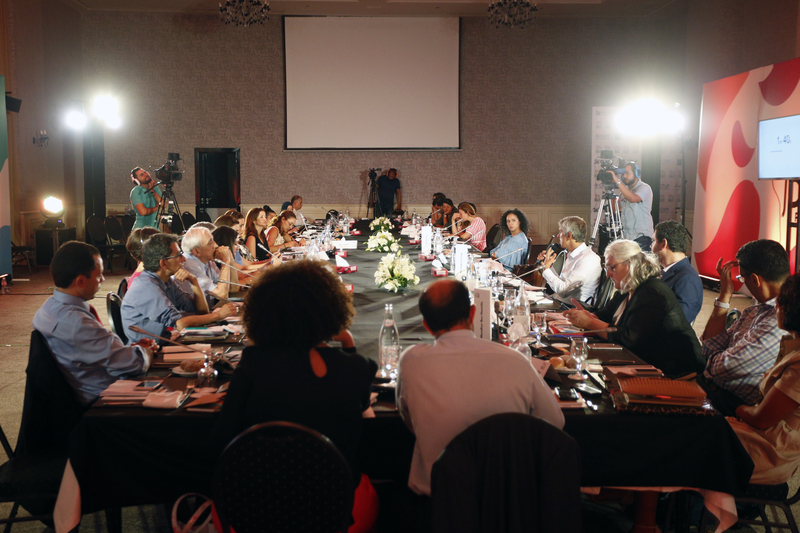 Each edition of Afkar produces a White Paper featuring the day's conclusions and participants' commitments to act. 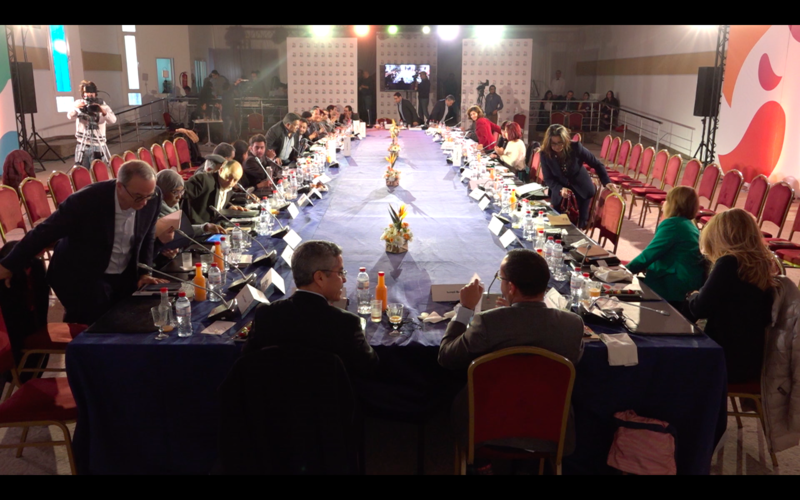 Le climat des affaires : Quelles réformes législatives pour valoriser le site Tunisie ? 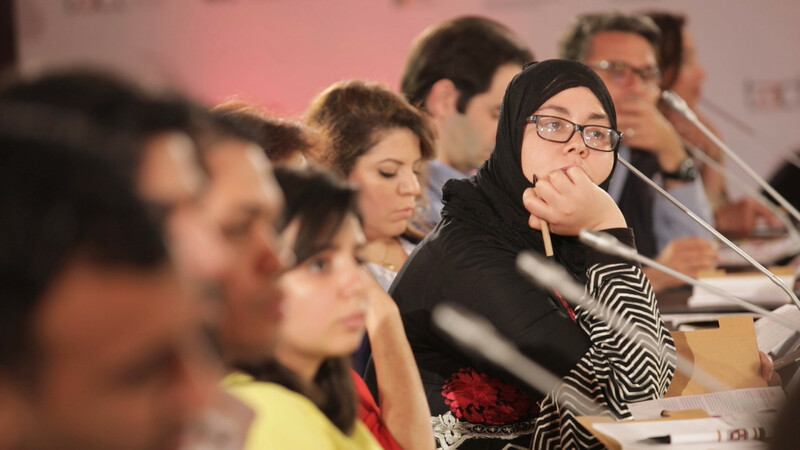 What is the Future of the Compensation System in Tunisia? 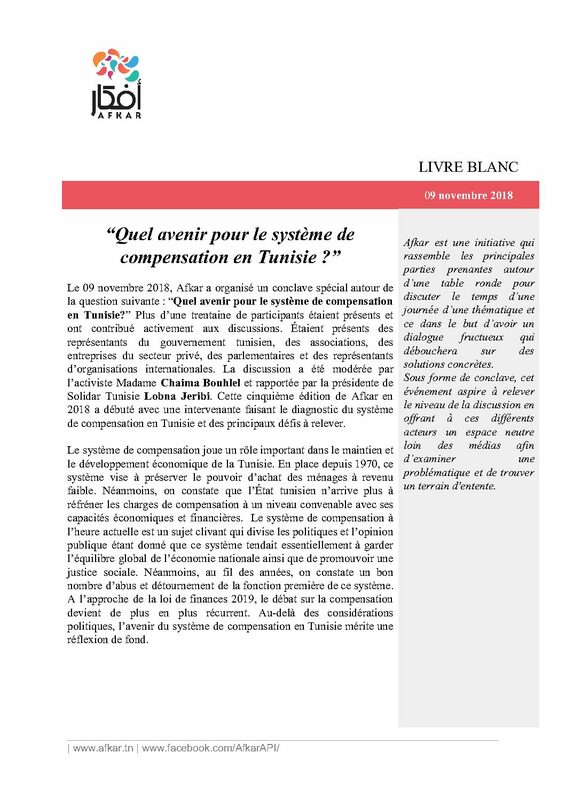 Quel avenir pour le système de compensation en Tunisie ? 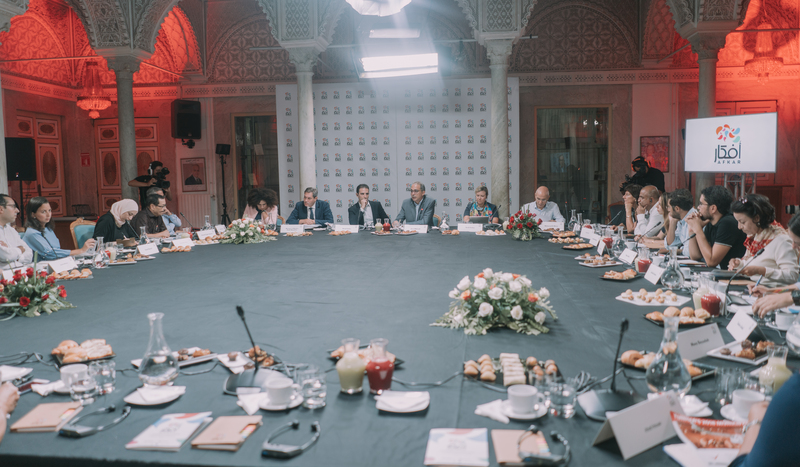 Decentralization Set In Motion: A possible vector towards economic revitalization at the local level? 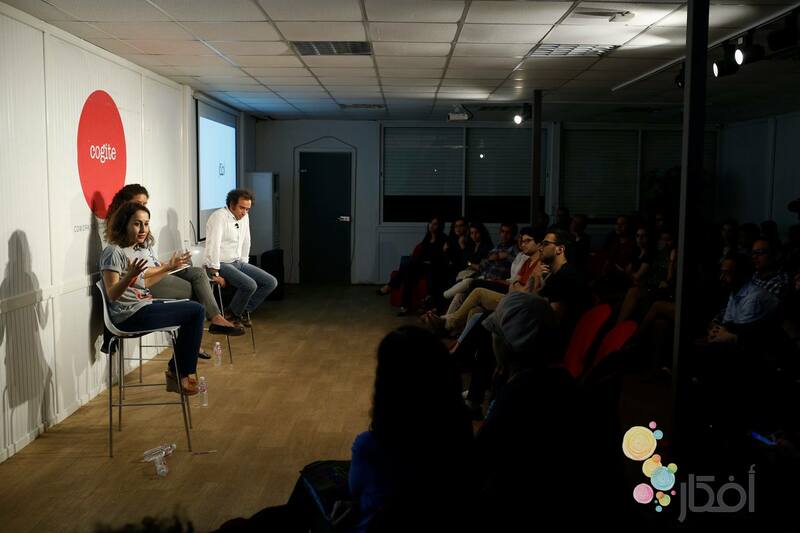 La décentralisation mise en route : Un vecteur vers une revitalisation économique au niveau local ? 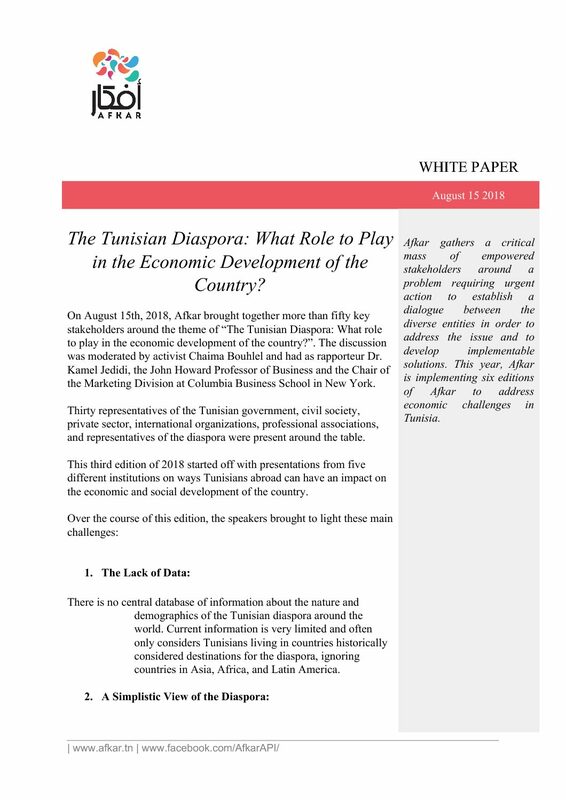 The Tunisian Diaspora: What Role to Play in the Economic Development of the Country? 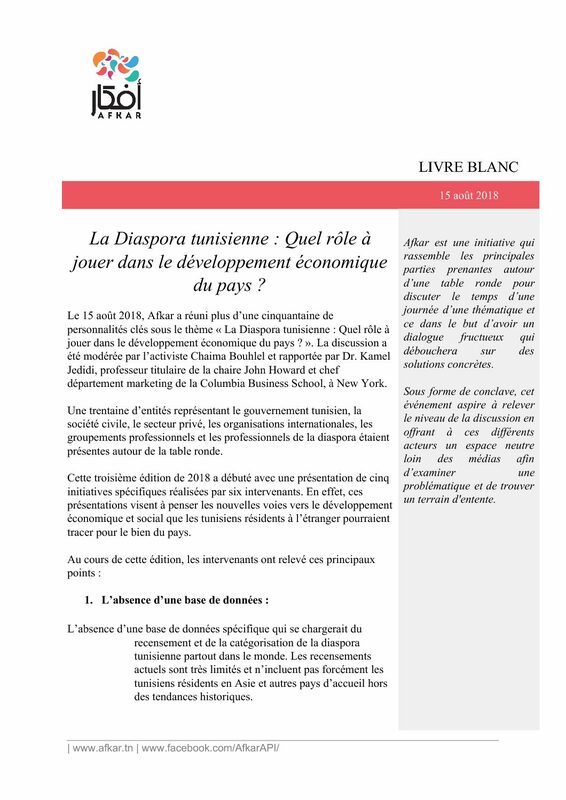 La Diaspora tunisienne : quel rôle à jouer dans le développement économique du pays ? 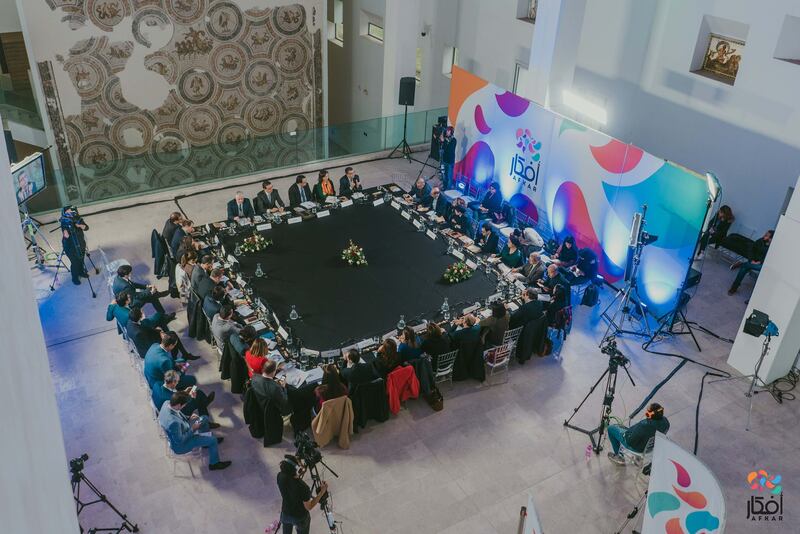 Afkar gathers key stakeholders around a defined problem to develop implementable solutions, and make joint commitments for attending stakeholders to act within their spheres of influence. 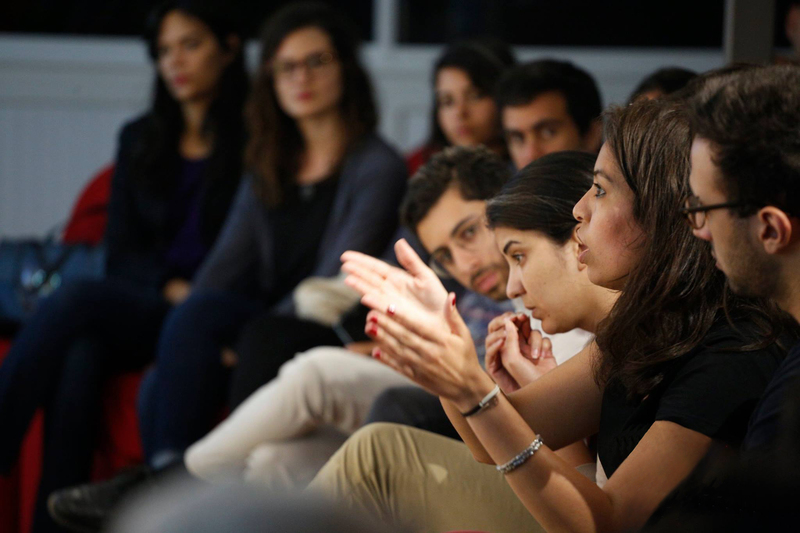 Between editions, Afkar works to raise the level of discourse and cultivate the next generation of decision-makers through public discussions, videos series, and fellowship programs. 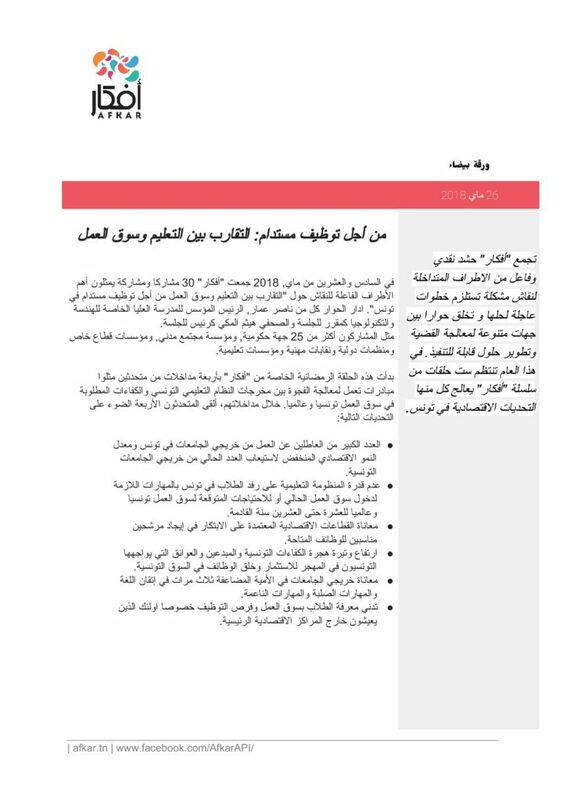 Each edition of Afkar concludes with the publication of a White Paper featuring the conclave's conclusions and commitments to act. 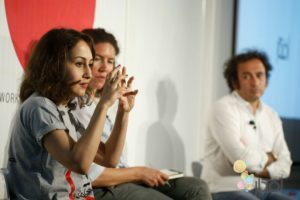 Le citoyen Tunisien : Est-il vraiment en faveur de la lutte contre la corruption ? 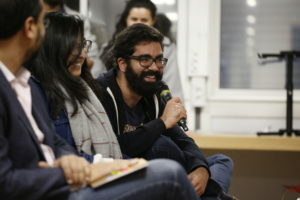 Un système judiciaire faible : Comment conduit-il à la corruption ? 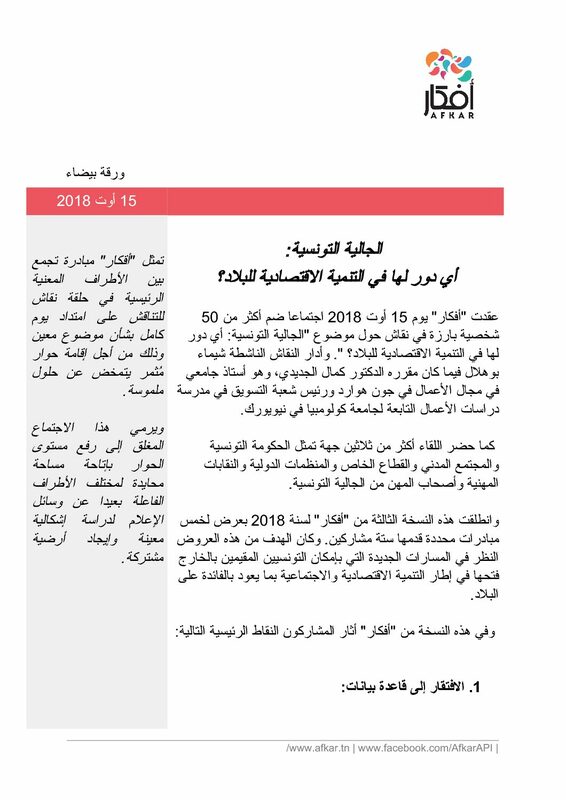 La corruption après Ben Ali : Qu'est ce qui a changé ? 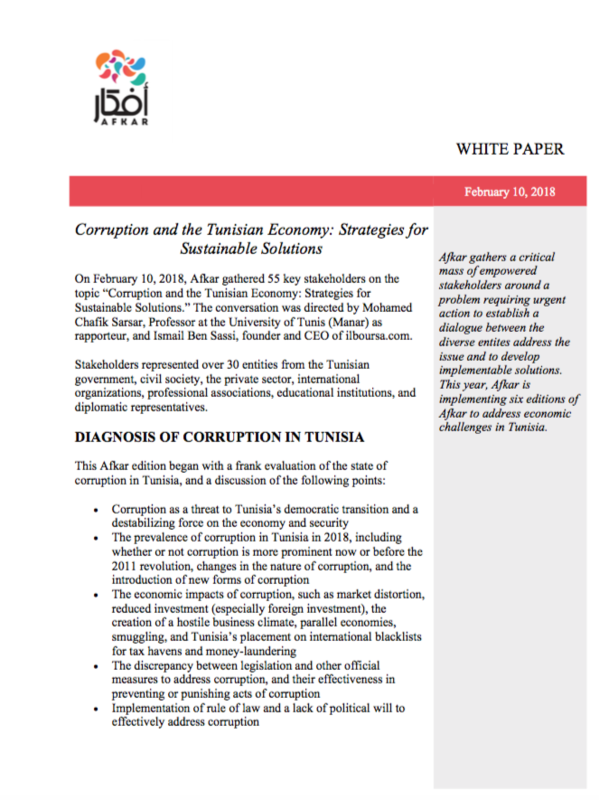 La corruption en Tunisie: Réalité ou illusion ? La corruption et l'économie : Quelle en est l'influence ? 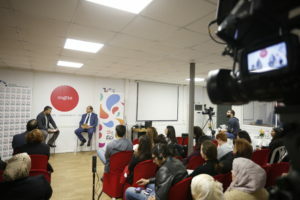 Afkar Talks are public events featuring high-profile, distinguished experts brought together around a specific subject. 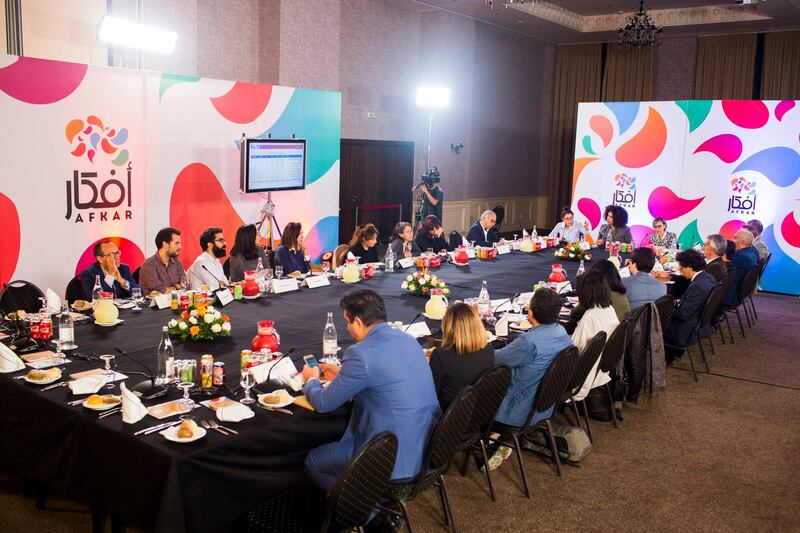 Staged as a moderated conversation, rather than a lecture, these events provide an intimate, interactive means for the audience to learn from and engage top thinkers. 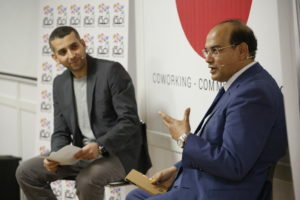 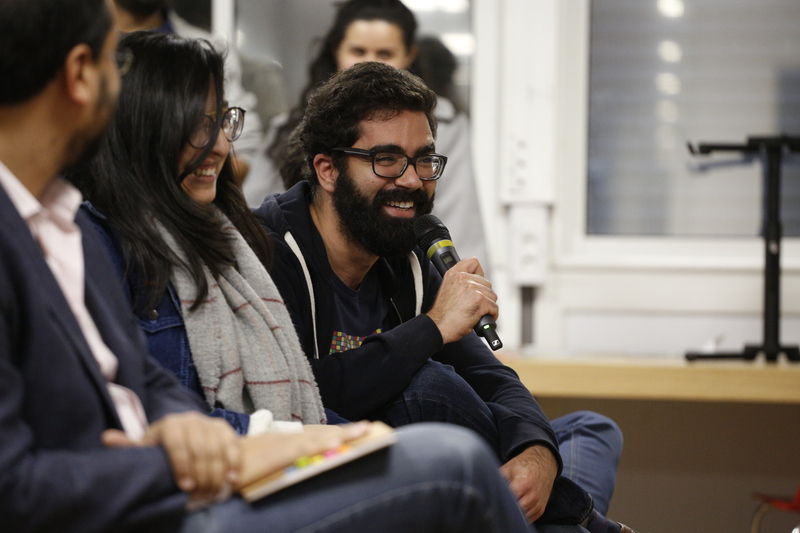 These events are publicly accessible and streamed live to include as many participants as possible; Afkar talks also serve as important networking and relationship-building opportunities for participants. To launch the Afkar Talks series, Afkar brought together two leading voices on the subject of legislating authoritarianism, Amr Hamzawy (former Egyptian parliamentarian, civil society activist, and scholar) and Amira Yahyaoui (Al Bawsala), for a facilitated discussion moderated by Heba Morayef (North Africa Research Director for Amnesty International, former Human Rights Watch Director in Egypt). The event, “Legislating Authoritarianism: Contemporary Challenges in Egypt and Tunisia” was highly attended by members of Tunisian civil society, researchers, public intellectuals, and engaged young people.